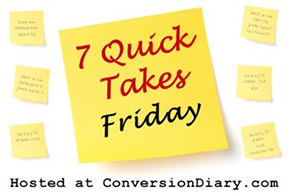 My thanks to Conversion Diary for hosting Quick Takes! We got some bad news in regards to our van this week. Like several thousand dollars bad. Not sure what we are going to do at this point. The van is probably not worth much more than the work it needs. And we are at full capacity in it right now. But do I really want to be driving a bigger van in the snow and having to parallel park that bad boy in front of my house? In general, I think homeschooling in my area is fairly easy. Except in June. June is when I must prepare the portfolio of our school year. I also have to get all the paperwork done to tell the state I am homeschooling for another year. It's not hard, it's just a lot of busy work. And I hate busy work. The pool opened this week. The kids have been begging me to take them, but it has rarely gotten above 70 degrees. In fact, two days I called the pool and they weren't even going to open due to the low temperature. Finally I agreed to take them and we went this afternoon. We were there and back in an hour fifteen. IT WAS FREEZING COLD! We are talking sick in your stomach cold. I did snap a few photos before the kids realized how cold they were. At least I don't think the kids will bug me for a couple of days about the pool. They were really cold! The cold pool experience reminds me of a time that hubby and I were camping in British Columbia with friends. There was this gorgeous river and it was August and we jumped right in. Didn't even hesitate. The water was so cold that I thought I would drown. I could barely swim back to the shore. You knew immediately something was very wrong. I have never experienced anything so terrifying and cold. So what did we do? We decided to convince our friends that the water was great and they should also jump right in as well. Because we were really good friends like that. Everyone seems to be getting sick around here. I am sure that swimming in a freezing cold pool really helped that fact. Summer colds are the worse! Next week is super busy for the boys, so being sick is not ideal. So far Michael and Malcolm are the worse, but the other kids have been super emotional and have started complaining about stuffiness. I can't have a Quick Takes without at least one photo of my favorite baby! Malcolm adores this car that Margaret got for her American Girl knock-off. He climbs in it himself, but he can't get out. It is the most darling thing! 2- overgrown radishes or beets!? #2 - Kohlrabi. I don't know any other root vegetable that has the leaves growing out of the sides of the root in this way. Melt butter in a large saute pan. Add everything else, saute until the kohlrabi are tender crisp, about 8 to 10 minutes. Season to taste with salt and pepper. Ugh on the van and the portfolios. But that baby in the car. Too, too cute!! Man! Such a bummer about the CSA! I was about to join one by us and I just couldn't decide if it was worth it. We have a small garden and get a good bit, but not as much variety as I'd like. Maybe next year I should just plant more! Bummer on the van - I feel your pain.